I’m so glad you’re here checking out project #6 in Mod Podge Week! 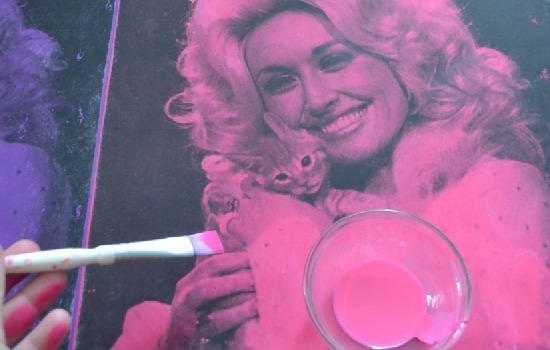 Today we’re using the original Mod Podge matte for photo transfer to make some insanely fun crazy cat dolly pop art. 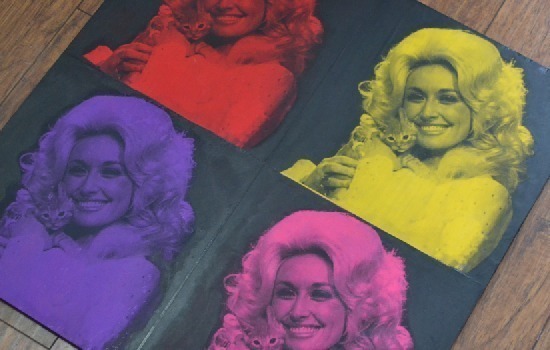 Oh, and you’re interested in painting your own pop art, check out this tutorial from photo to software to transferring to canvas. 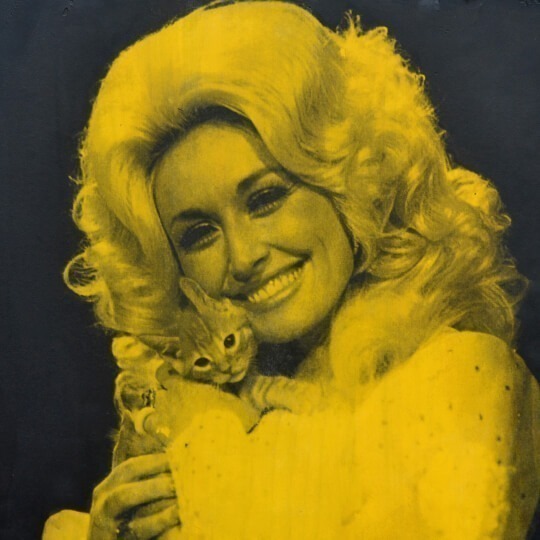 I’ve always, always loved Dolly Parton. I mean, what’s not to love? 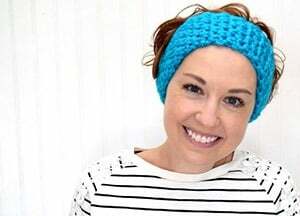 She’s beautiful, funny and, if what I’ve heard is accurate, incredibly sweet. I love her music and I love her flashy style. And when I was in junior high and high school I’d listen to her music in bed. Because back then they didn’t prescribe medicine for teenage insomniacs. No, I’d just lay in bed waiting until Momma flicked that light on signaling that it was time to get up. So music helped keep me calm. I’d listen and sing and try to be content that I had time to rest even if I didn’t get to sleep. 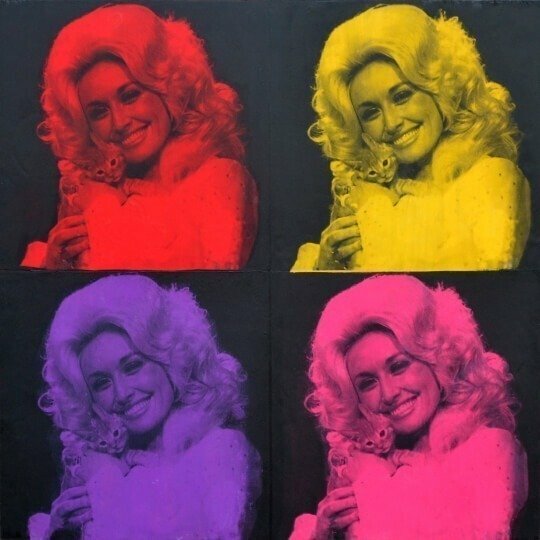 I had a few CDs that I kept on shuffle, one of which was our Miss Parton. 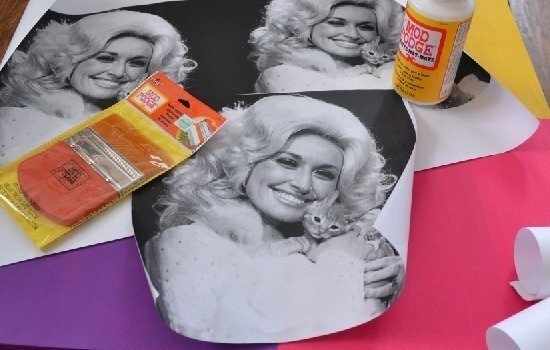 The image I’ve had on my computer forever and only recently found a project for!So when I was a senior in high school and had my wisdom teeth surgically removed, I was incredibly surprised when I realized that Dolly Parton herself was the oral surgeon’s assistant. I mean, how crazy is that? And she was so nice and so chatty. Kind of grabby but, hey, I was having a procedure done. But considering I also managed to wake up a little too early and get away at the end of my surgery only to lock myself in a bathroom, pass out and finally get coaxed out by my mother to get back into the chair, I think it’s pretty safe to say that I my attendant was probably just a blonde lady with a twang.But I still love Dolly Parton. 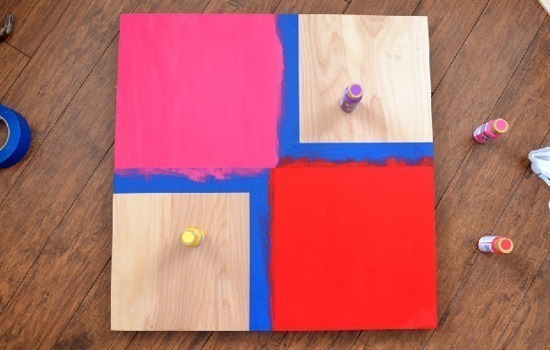 Use a yard stick and mark off your first two squares to paint. 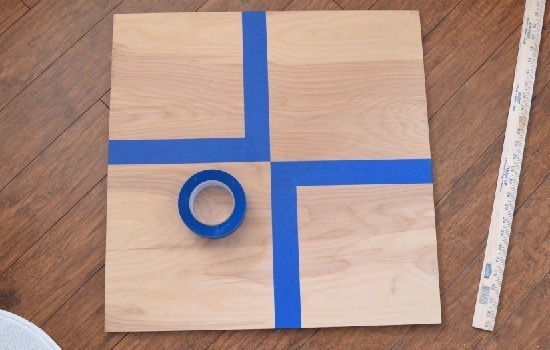 Paint those squares and allow to dry, then peel the tape away. 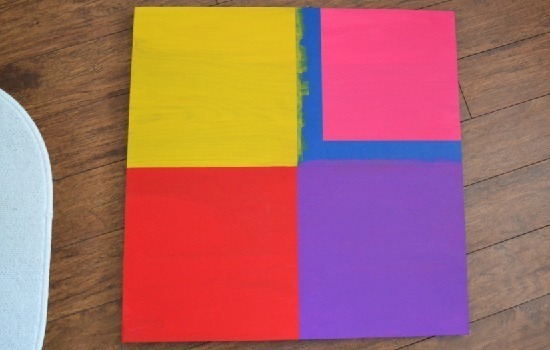 Tape off the other two squares, paint, allow to dry and remove. I’d recommend allowing your paint to cure at least a few days so that you don’t have to worry about the paint coming up on you when it gets wet again. I gave my board 7 days since it’s been really humid and frequently raining here and it worked out well for me. Now I had my prints run at Staples. They’re actually engineering prints. I got two Dollies on one of the smallest so I had two printed for around four or five bucks. Cut down to remove the excess border on the edges. A few words on your prints. If necessary, remember to flip the image. I actually had these printed at Kinko’s first and they got things all sorts of messed up and they sent me four little dollies each on a regular piece of paper. They measured about 8 inches across and just wouldn’t work. 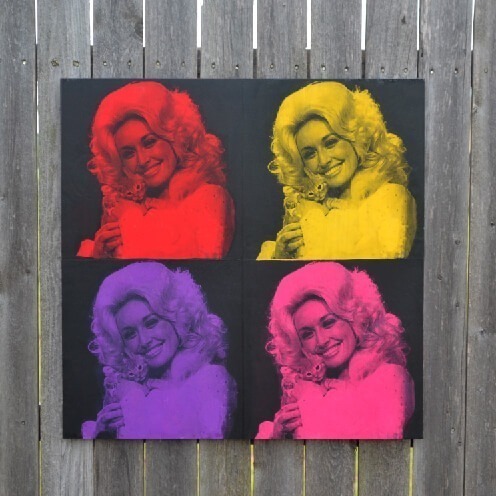 In my ordering and reordering I apparently flipped my image one too many times so Dolly is technically backwards. Now, I’d highly recommend going with Staples, not only because they didn’t jack up my order but because the cost was much, much cheaper for the size you are going to need. Okay, moving on. Take and give a really, really healthy coat of Mod Podge matte onto one square. I used this Mod Podge brush and I’d HIGHLY recommend it. Your paper is going to want to shift and slide around with the coat of Podge underneath, but hold still and smooth all of the wrinkles out. You want it to be as smooth as possible. I used my squeegee to make things easier. Again, highly recommend it. Keep an eye on this piece for at least 15 minutes because bubbles and wrinkles might magically pop up on you and you’ll need to get them smoothed out. 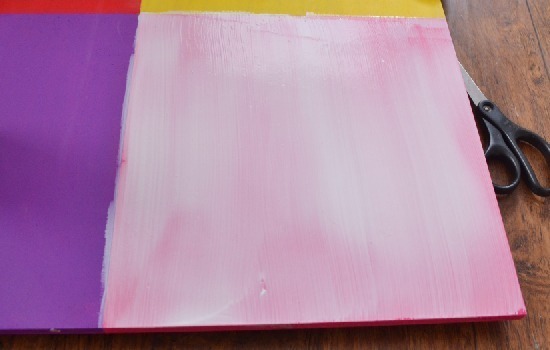 Continue this process for the three other squares on your board and set aside to dry for at least 12 hours. I went 24 just to be safe. Bring out your big bowl of water and a rag or a sponge and prepare to have your hands be the smoothest they’ve ever been in your life. Why? Because we have to rub all of this paper away and it takes quite some time and friction. My hands are really soft and, I don’t know if this is a good thing, but they’re also shiny! So here’s the process from top to bottom. Get the paper really wet, until you can see the image through it. 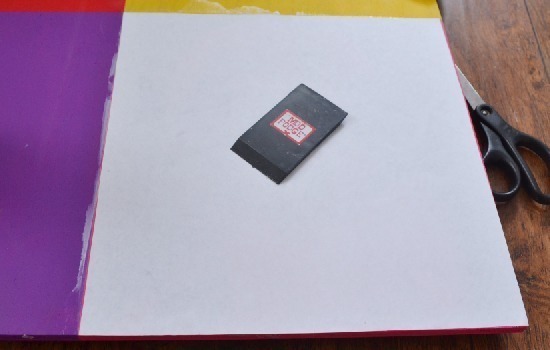 Use your fingers and start to gently rub the top layer of paper away. It will start to ball up and look like spit balls which means you’re doing it right! Continue on to the other squares and continue as needed until the paper is gone and the image is no longer cloudy. Now see the image at the bottom? The purple is one pass and the pink is two passes. I believe it took me 5 passes and two movies to fully remove the paper from all four square feet of Crazy Cat Dolly. Now there are some places that are stained white from the Mod Podge and they stand out pretty badly. 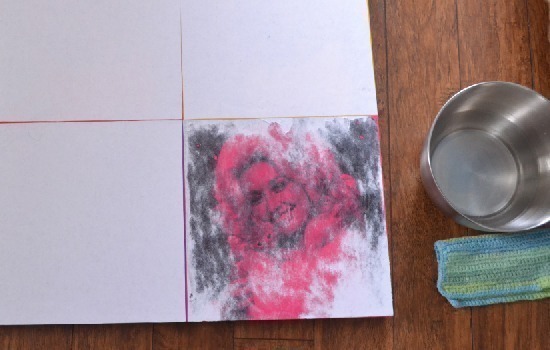 Take your original acrylic paint and water it down. Like one drop to one tablespoon of water. Lightly paint to cover these areas. Now because my Dollies weren’t the perfect size I had strips of color in between each. 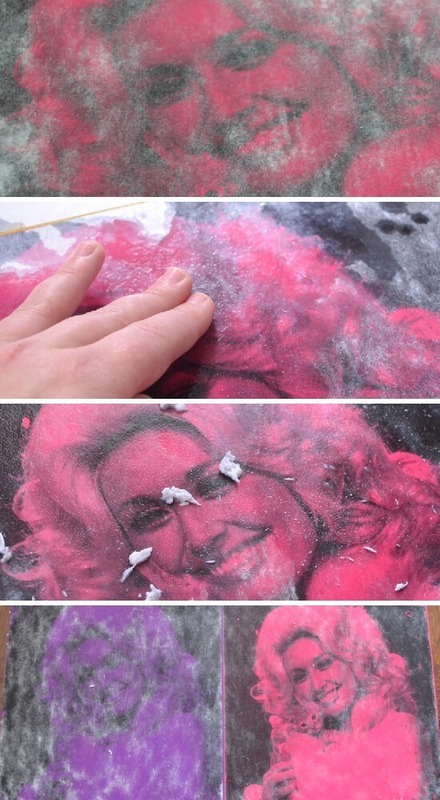 Use black paint to touch up these areas as well as anywhere that the transfer came out kind of messy. But be sure you pay attention. I used satin paint and see how it’s kind of shiney in places. But it is what it is and straight on it isn’t so obvious. Didn’t she come out well? My favorite Dolly is yellow Dolly probably because there is the greatest difference between the black and paint color. So keep this in mind. I tried to use lighter reds and purples and while you can still tell what is going on, I think I would have preferred to use slightly lighter colors still. Well, that’s today’s edition of Mod Podge Week! I had such a hard time holding this Dolly pop art under my hat until today because I love it. LOVE IT! Now if you’ve missed any of the other projects from Mod Podge Week, no worries. You can visit them here: #1 Mod Podge & Gift Wrap Lamp at Mom Spark (featured on Mod Podge Rocks, y’all!) – #2 Mod Podge Outlet Covers – #3 Mod Podge Lace Vases Tutorial – #4 Mod Podge Lace Covered Vanity Tray. #5 – Printed Reverse Saddle Shoes. 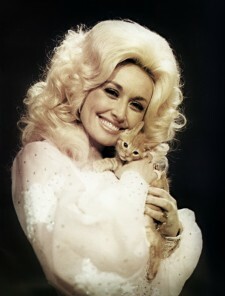 I am sitting in Starbucks (supposed to be working) giggling hysterically at Dolly Parton being your surgeon's assistant! Several people in suits are looking at me funny :). Your pop art is so fun and smart! I am really a mod podge novice and am learning so much this week! I'm loving this so much! Dolly is amazing, and your story about getting your wisdom teeth out made me actually laugh out loud, haha!! I absolutely LOVE this. What a brilliant idea. I love the technique and I love that you used Dolly. I think I need to recreate this exactly. Thank you for sharing this!